Black Widow Director Decision Near | Nerd Much? It sounds as though we’re getting closer and closer to a Black Window film becoming reality. Deadline has reported that Marvel has narrowed down an extensive list of candidates down to a final three to decide who the Black Widow director will be. The outlet has listed Amma Asante (Belle) and Maggie Betts (Novitiate) as potential directors on the project. However, Deadline states that they’re hearing Cate Shorthand, the Australian director of 2017’s Berlin Syndrome, as the leader in the clubhouse. After edging out a field of 49 potential directors, the trio have each sat down for a meeting with both Kevin Feige and Scarlett Johansson. Back in January reports began to swirl of Scarlett Johansson finally getting her time to shine in a solo Black Widow movie. Marvel Studios hired Jac Schaeffer to pen the script for the film. Schaeffer has a few other credits under her belt including a Dirty Rotten Scoundrels remake titled The Hustle. The film comes out in August with Anne Hathaway starring. There’s been no indication as to what direction the upcoming Black Widow project will take. We likely won’t hear much of anything regarding the movie’s plot for some time. Marvel is being quite reserved with any information pertaining to events taking place after 2019’s untitled Avengers 4. Because, you know, spoilers. Hopefully we’ll get some kind of confirmation that the project is indeed greenlit during July’s San Diego Comic Con. Perhaps that’s where Marvel will take the time to announce who the Black Widow director will be. Whichever of the three that is chosen will become the first woman to helm a Marvel Studios movie on their own. Anna Boden was the first female director to be hired for a Marvel movie, but she splits directorial duties on Captain Marvel with her co-director, Ryan Fleck. 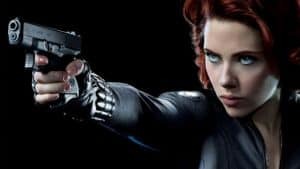 Should the project run smoothly from here on out, there’s a chance we could be seeing the Black Widow solo movie as early as 2020.